It’s hard to imagine a world today where sport is not a dominant cultural force, up there alongside music, fashion and technology, but until the 1970s it just wasn’t. Depending on the social profiles of the players, sports were either played out behind a purple rope or in regional ghettos, and support was largely indistinguishable from sectarianism. It was either elite or it was ugly. The last thing sport ever looked like becoming was a ‘lifestyle’ choice, something that would affect and influence almost every area of what we wear and, indeed, what we drive. Cars and chronographs have a shared history; the use of the former exploded exponentially with the spread of the automobile out of Europe around the start of the last century. Of course, by the 1970s, car manufacturing was a global business: the Americans made extravagant cars, the Brits, clever cars, and the Italians, fast and beautiful cars. But still no one nation ‘owned’ cars the way the Swiss owned watches. No one nation built the ‘best’ cars. But that was about to change, with the birth of ‘the German car’ as a cultural trope in its own right. And, it just so happened that sport as a lifestyle choice was at the heart of it, with the car that defined the era being the Volkswagen Golf GTI. Don’t get me wrong, I’m not saying the Golf GTI was the foundation stone in the construction of the VW Empire – an empire that will, if all goes according to plan, top-out with the group’s ascendency to number-one world status by the end of this decade. The Plain Jane Mk I Golf is that car, whose runaway success remodeled the European car market and fuelled VW’s run of acquisitions. It also became the building block for a new way of making cars where shared, unseen components of undoubted quality would underpin a greater and greater variety of products with different badges (Audi, Porsche, Bentley), and VW would develop brand management skills to match its engineering nous. And it learned to do that with the GTI. The original Golf GTI, introduced in 1976, just two years after the basic car, wasn’t the first family car to get a slightly edgy ‘motorsport’ makeover; it wasn’t even the first hatchback to get heated through. It was, however – like all history’s real game-changers – far and away the best executed and the best communicated. 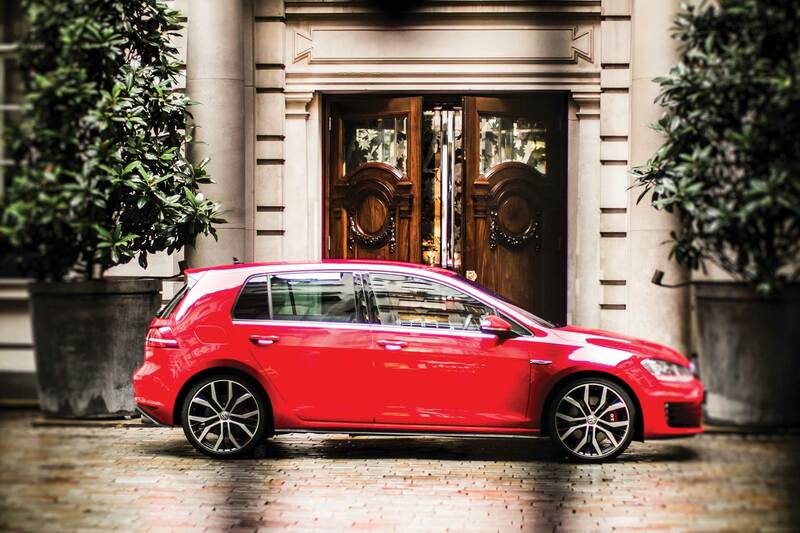 A 1.6-litre fuel injected engine meant that the GTI would reach 110mph in a world where few family cars would reach 100. That name GTI – Grand Touring Injection – possessed an echo not only of a more romantic era (the 1920s) but also a whiff of exotic technology: Fuel injection was something the Italians were playing with on their supercars. Most of all though, the GTI anticipated the seismic shifts coming in the sports marketing world and gave its buyer the chance to park something outside that said, “I’m sharp, I’m athletic, I’m lean, I’m young… I’m just that little bit better than you.” Not a sports car per se, more a sporting lifestyle accessory, an affirmation that had no intent of the owner giving in to the passing of time just yet. Watchmakers were quick to catch the same meta-trend, embracing the iconography of sport to add a lifestyle twist to products that could seem, to a new post-war generation, just too darn serious. This was especially beholden on the younger brands, like Hans Wildorf’s Tudor, established immediately after the war to provide a pathway to Rolex ownership. The Oysterdate Chronograph, launched in 1971, was never – and still is not – called officially ‘The Montecarlo’; the name coined by enthusiasts because of the dial’s resemblance to a casino roulette wheel, yet the mere fact that the name has stuck is proof the Oysterdate has ascended to that special place where full names are no longer required. Likewise with the Golf GTI, when someone talks about a GTI, there’s only one car they’re talking about, and a Montecarlo is always a Tudor. The latest iteration of the Montecarlo was re-introduced in 2013 as the Heritage Chrono Blue and signaled a seismic shift upwards of Tudor’s covet-ability number. Handsome and edgy on its steel bracelet and carelessly cool on its optional fabric strap, the 2013 watch is effectively the Mk IV Montecarlo and is utterly of the moment. By the way, for those keeping count, VW is up to Mk VII with the Golf, but that maybe says more about the relative durability of automotive vs timepiece design. Originally available in two colour ways – the now legendary blue-grey combination and also a black-grey – the Montecarlo went through three iterations during the 1970s with one model sporting a Plexiglass bezel with 500 unit per hour graduated tachymetric scale and another a steel engraved bezel. But it was the model 7169 with a rotating bezel featuring 12 hour graduations that inspired the very latest Tudor Heritage Chrono Blue. None of them were produced in any great number, yet each is a perfect little time capsule, a playful-yet-potent assembly of simple graphic elements so typical of the 1970s. These include the boldly framed sub-dials, the sublimated date window set directly opposite the proud Tudor shield at the base of the dial, along with the sheer size of the thing – the 7100-series had a 39mm case. It’s of the future yet of the past, possessed of what may have recently appeared a slightly naïve take on a brave new world, but which we now see was confidence in a new world order, no less. And as technology continues to turn our worlds upside down on a daily basis, it’s no wonder the Montecarlo has become a totem, once again, for those who covet the past as potently as they crave the future. We need these companions, these time travellers who very consciously evolve yet never entirely reinvent their identities, happy that what they originally stood for is worth preserving. Me, I love to see someone ‘wearing’ a Golf GTI. It doesn’t so much as say “I don’t care”, but, more appropriately, “I do care, but it matters less to me that you know that”. It’s the pure confidence of informed understatement, which is exactly the same force that drives the Tudor Montecarlo’s enduring appeal.